View cart “Viaggi Infiniti [Endless Journey]” has been added to your cart. The Sonatas for Violin and Obbligato Harpsichord BWV 1014, 1016 and 1017 by Johann Sebastian Bach, featured in this CD, belong to a group of six, which also includes Sonatas BWV 1015, 1018 and 1019. 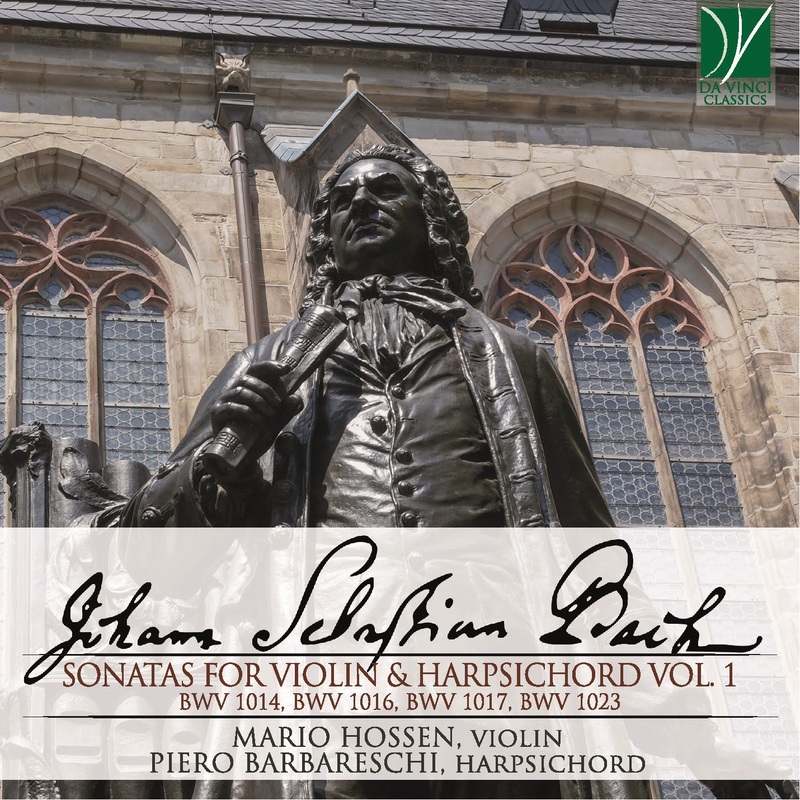 Together with the three Sonatas and the three Partitas for unaccompanied Solo Violin BWV 1001-1006 and the Sonatas for Violin and continuo BWV 1021 and 1023 (the latter of which is included in this CD), they were all composed by J. S. Bach during the period he spent in Köthen, between 1717 and 1723, when the composer was employed at the court of Prince Leopold of Anhalt-Köthen. Prince Leopold was a practising Calvinist, and the religious principles of his confession did not admit complex liturgical music in the official worship. As a consequence, Bach did not compose sacred music for him, and his output for that period comprises mainly chamber and solo instrumental music: among these, he created masterpieces of exquisite beauty, exploring new instrumental combinations, stylistic options and ensemble interactions. Amongst the many works composed over that period, suffice it to mention the Brandenburg Concerts, together with the Orchestral Suites, the Cello Suites and the first volume of the Well-Tempered Clavier: this sample shows the extraordinary inspiration and fruitful creativity of Bach’s Köthen period. This positive framework was also encouraged by Prince Leopold’s competence and passion, as he was a highly gifted, enthusiastic and passionate amateur musician, who aimed at embellishing his court with a first-rate instrumental ensemble performing a rich and complex repertoire. Bach’s Sonatas for Violin and Obbligato Harpsichord number undoubtedly among the greatest works for violin of all times. The two instruments’ dialogue is on a plane of equality; the harpsichord part requires, today as at Bach’s time, an extraordinary proficiency and skill, given its particularly demanding technical passages. In fact, in the first published editions of these works, they are titled “sonate à cembalo concertato e violino solo”, (“sonatas for concertato harpsichord and violin”): in comparison with today’s use, the inverted order of the instruments’ names mirrors the awareness, already present then, of Bach’s brilliant use of the keyboard. In the harpsichord part, each hand plays one of the two further melodic parts which complement the solo violin’s: this creates a sound texture where Bach’s expressive and harmonic insights, as well as his ability to balance the three voices and vary the musical phrasing, achieve levels of expression never equalled. The sonatas are structured according to the traditional form of the sonate da chiesa, which featured four movements (alternatively slow and fast); with the only exception of BWV 1017, therefore, neither the form nor the rhythm of dance music are alluded to, different to what happens in other pieces for keyboard instruments, for strings or for orchestra. The Sonata BWV 1014 is in the key of B Minor, which was rarely used in keyboard music of Bach’s time, but which Bach explored also in the fascinating Sonata for flute and obbligato organ BWV 1030. The work opens with an Adagio where expressive violin phrases contrast with a cadential progression of harpsichord chords. From the very beginning, the violin conjures a meditative and melancholic atmosphere, while later its interplay with the keyboard takes the form of shared and exchanged musical figurations. The following Allegro, again in a minor key, evokes a more tranquil and dynamic climate thanks to the masterful counterpoint of the voices which seamlessly follow each other. In the more serene third movement, an Andante in D Major, three voices intertwine with a noble and flowing pace. The fourth movement, an Allegro, again in B Minor, is decidedly more brilliant: it is an energetic piece, adorned by figurations and chords which embellish its melodic ideas and enliven them with agile dynamism. Also the first movement of Sonata BWV 1016, an E-minor Adagio, is characterised by the distinguishing scoring of the harpsichord part; however, unlike the first movement of BWV 1014, the initial structure is sustained until the end. On this hypnotic basis, whose modulations are unforgettable, the violin draws long phrases featuring a summa of the expressive and decorative artifices typical of the era. The second movement is enthralling and surprising: the three parts seem to constantly chase each other, in an unleashed counterpoint, which seems to aim at providing the listener with a surplus of energy. This will be required in order to face the emotions triggered by the third movement, Adagio ma non tanto: this authentic masterpiece is startling for the modernity of its the harmonic textures, or possibly for a timeless quality which only Bach’s abstract music succeeds in achieving. Beside its underlying brilliant inspiration, the unpredictable use of rhythmical patterns in phrases which contrast binary and ternary structures creates a surprising effect. A captivating and exhilarating Allegro in E Minor concludes the work. The first movement of Sonata BWV 1017, a C-minor Largo, can be definitely numbered among the greatest masterpieces. As mentioned earlier, in this instance, the only one among the six sonatas, we find a movement with the typical rhythm of a dance, the Siciliana. Here, the likeness with Erbarme dich, from the St Matthew Passion of St Matthew, is evident to the perceptive listener, not only because of the structure of the melody, but especially for the poetic and inspired quality that pervades the whole piece. In the second movement, Allegro, the solo harpsichord introduces a long opening phrase of five bars, in the flowing imitative style we have by now become familiar with: this provdes the composer with the necessary elements to establish an elaborate exchange amongst the three voices. The ensuing Adagio, beginning in E-flat but concluding on a suspended chord of G which anticipates the return of C-minor in the following movement, is a perfect example of pastoral, bucolic music. A soothing progression of triplets performed by the violin unwinds with its calm and reassuring flow. The last movement, an Allegro, recovers the austere nobility of the work’s general tone, with a pace and attitude that take after the most emblematic examples of Bach’s concertos for solo violin and strings. While the Sonata BWV 1023 in E Minor for violin and continuo is also structured in four movements, it follows a completely different approach. The first movement is essentially a long violin cadenza, creating complex figures above a long pedal of E in the bass. In contrast with such a marked presence of the bass in the first movement, the following Adagio seems to show the composer’s delight in articulating elaborate rhythmic phrases with his usual virtuosity, despite its serene atmosphere. The last two movements, Allemande and Gigue, are dance forms, as was customary at the time. In fact, tradition prescribed a more solemn Allemande, whilst, as in the Suites, the concluding Gigue closes the sonata in a lively and joyful luminosity. Mario Hossen received his musical education in Sofia, Vienna and Paris. He made his debut as a soloist with an orchestra at the age of eight. His teachers included great pedagogues such as Michael Frischenschlager and Gérard Poulet. Mario Hossen is the artistic director of the Camerata Orphica and founder of the International Music Academy Orpheus in Vienna. Hailed for his incredible virtuosity and charismatic stage presence, Hossen plays a repertoire that ranges all the way from Renaissance music to Classic music to contemporary works and Jazz. As a concert soloist of international acclaim, Mario Hossen has performed with renowned orchestras such as the Academy of St. Martin in the Fields, the Vienna Chamber Orchestra, the English Chamber Orchestra, the Tchaikovsky Symphony Orchestra, the Bruckner Orchestra Linz, the Orchestra della Scala di Milano, the Royal Philharmonic, the Orquesta Sinfónica del Estado de México, the Prague Radio Symphony Orchestra, the Sofia Philharmonic and the Nordwestdeutsche Philharmonie. Hossen has performed with outstanding musicians like Bruno Canino, Vladimir Fedoseyev, Philippe Bernold, Nayden Todorov, Borislav Ivanov, Leslie Howard, Adrian Oetiker, Gérard Causse, Roy Goodman, Vladimir Mendelssohn, Boris Mersson, Leon Bosch, Dominique de Williencourt, Georges Pludermacher and Jean-Bernard Pommier - among others. Several contemporary composers have dedicated works to Hossen and Hossen has commissioned works to com posers, such as Tomas Marco, Rainer Bischof, Walter Baer, Gheorghi Arnaoudov, Francois- Oierre Descamps and Alessandro Solbiati. Hossen’s musicological and artistic endeavors are focused among other things on source research on Niccolo Paganini. The complete oeuvre of Paganini for solo violin and for violin and orchestra will be released as a historical-critical edition by Doblinger Music Publisher Vienna. Hossen plays all concerts exclusively with his preferred strings, the Vision Titanium Solo strings manufactured by the Viennese company Thomastik-Infeld. Piero Barbareschi, born in La Spezia, he studied piano with Martha Del Vecchio and harpsichord with Anna Maria Pernafelli, having a diploma from the “Cherubini” conservatory in Firenze with the highest votes. Interested to different forms of expression and artistic collaboration, both with piano and harpsichord, he performs as a soloist but also in different chamber orchestras. He worked with prestigious soloists such as the violin players Felix Ayo, Cristiano Rossi, Franco Mezzena, Thomas Christian, Thomas Schrott, the flautists Mario Ancillotti and Mario Carbotta, the mezzo soprano Susanne Kelling, in the most important italian and foreign countries (France, Switzerland, Austria, Germany, Belgium, Bulgaria, Czech Republic and USA), as guest of important institutions and Festivals. His repertory goes from the '600 to the authors of the '900 and contemporaries, including first absolute performances. Founder member with Marcello Defant of the barocco ensemble “Officina de li Affetti”, he worked with a great number of orchestras such as Sammartini Orchestra of Milan, the Filarmonici of Torin, the chamber orchestra of Fiesole, the Virtuosi of Pargue. Salzburg Chamber Soloists, Orchester Konservatorium Bern, Jugendsinfonieorchester of Potsdam, the Filarmonici of Verona, Vox Aurae, International Orchestra of Italy, italian interpreters etc. with different directors: Rudolf Barshai, Giuseppe Garbarino, Lonnie Klein, Federico Maria Sardelli, Diego Fasolis. Member of the board for the ECYO selections, he also made recordings for the RAITV and for companies such as Brilliant Classics, Nuova Era, Dynamic and Musikstrasse, publishing, for this last company, a double CD with the six Quintetti op. 56 of Luigi Boccherini, together with Quartetto Elisa ( first recording in Italy). He also made for the Tactus the first modern recording of two concerts for piano and strings orchestra of Simon Mayr. Registered to the list of journalists as a publicist, he works for the musical divulgation with guided audiences, conferences, articles and is a member of the editorial staff of www.gothicnetwork.org, italian artistic review portal.